Last summer, the heat kept many parts of Europe in its grip. The persistent summer temperatures had a direct impact on the potato harvest. Lower yields were reported in Northern European countries, but how is the situation now? Will there be an early end to the North European season? In the US, there are also mixed reports about last year's harvest, which is resulting in rising prices. In Australia, growers are looking forward to the start of the new season. The situation of the potato market in the Netherlands has a good and a bad side. On the one hand, processors are selling more, so growers are managing to retain their trade. Now that the frost has entered Europe, the supply of potatoes continues to fall. Moreover, the demand for good potatoes for fries keeps rising. On the other hand, the high prices are an obstacle to the export of fresh potatoes. For a long time, Africa had been buying large volumes, but several countries have now closed their borders to stimulate the local harvest. The figures from the Dutch Potato Organization (NAO) show that the export of consumer and industrial potatoes has decreased. Out of the total volume harvested in 2018, 367,000 tons in this category had been shipped to the border by the end of December. A year earlier, that figure stood at 385,000 tons. The decline is mainly due to the lower demand from Africa, down from 88,000 tons to 47,000 tons. The export of seed potatoes (2018 harvest) up to the end of December is also considerably lower than in the same period of 2017. Exports to countries in Asia and Africa in particular have fallen. Belgian trade is currently quiet. This is the result of the rising prices and growers gambling on further price increases. Yet there must come a time when the potatoes in storage will have to be sold, because, as a trader says, "otherwise the growers run the risk of not being able to sell in good enough conditions." Also, traders may have difficulties with their contracts. The quality of the potatoes is disappointing, which makes them wonder whether those contracts can be met. This is not expected to become clear before April. On the free market, prices for the Bintje range between 15 and 30 Euro, depending on the quality. For other varieties, prices above 30 Euro are reported. The contracts are a challenge for the market. A trader predicts that not every trader will be able to meet them. "This year, companies will go bust because of the contracts," he says. In France, the processing industry started purchasing early. This has given the market a strong boost from the start of the campaign. Prices continue to rise, and demand remains high despite the high prices. "Potatoes are considered a basic ingredient. Consumers will not easily be willing to buy less," explains a trader. A lot of French potatoes are still exported. The UNPT reported that exports reached 478,588 tons between August and November, which is 10% more than in the previous season. After France itself, Spain is the most important buyer of French potatoes for many exporters, followed by Italy. Another trader says that the demand from Spain, Italy and Eastern European countries has risen even faster since the beginning of January. Their own stocks are running out, so they are resorting to imports from France. The short deadlock in potato trade in the German market came to an end in mid-January. After the upturn in prices, there was a sudden surge in the market, especially in northern Germany (Lower Saxony), and growers were finally willing to market their goods. Prices have increased by approximately 5 Euro (per 100 kg) across the board. Moreover, the market also needs a steady supply, because the average quality of the potatoes leaves much to be desired, mostly due to the heat recorded last summer and autumn. In Lower Saxony, based on current forecasts, it is therefore assumed that current stocks will only last until the end of March. Furthermore, the supply of the slightly more floury varieties is expected to start a little earlier, probably in early March. 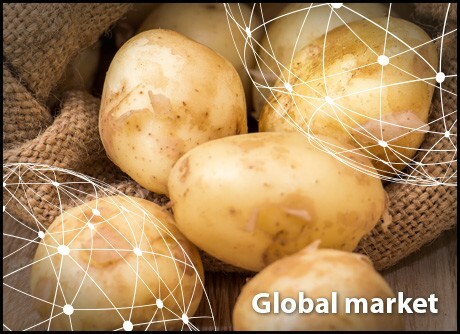 What the market situation will be like at that time will also depend on the date when countries like Egypt or Israel will start harvesting, as these traditionally export a lot of potatoes to Germany during that transitional stage. It is also expected that some will be imported from France around March-April, before the first early domestic varieties hit the market. The prices are high. This positive situation is the result of the shortage in Northern Europe. Italian growers with a large supply of good quality potatoes, especially those from the harvest in Emilia Romagna, are doing good business. Sales have been planned and the prospect is that there will be enough volumes for the rest of the season, which will last until the end of April. A potato and onion trader says that 2018 has been a good year for his company. The shortages in Northern Europe and the pressure from the processing industry have created a favorable environment. According to the trader, consumption is good. "The cold weather certainly helps. The volumes do not lag behind, so we expect to be able to supply the market until the new harvest arrives." There is a good demand for organic potatoes from Calabria. A grower says that "we are currently processing orders for seed potatoes. We have about 100 tons in storage; on average, 20 tons per variety." In his case, the varieties are the Kennebec, Marabel, Desireè, Divaa, Spunta and Agria. The sizes oscillate between 28 and 65. In contrast to other growing areas in Europe, there was sufficient rain during the flowering period. In some regions, the rain damaged between 20 and 30% of the production, but "the rest of the harvest is of excellent quality." At the moment, most of the supply comes from France, with the exception of some traditional, local varieties from the south, which have recorded a slight increase in the demand this year. The yield in France has been lower, so the prices are on the high side. Traders have nothing to complain about when it comes to quality. Given the current situation, growers in Spain think that the first early potatoes from Seville and Cartagena, which will arrive in spring, will likely reach high prices. The acreage in these regions is expected to grow compared to last year. Back then, the harvest was limited by the dry weather. This is bringing the acreage more in line with the figures from two years ago. The supply of domestic potatoes is limited and this has caused prices to rise slightly. A trader says that despite the harvest hitting the market, there is still a shortage in Wisconsin. "We had a challenging growing season and an even more challenging harvest season, so the supply is lower," says the trader. After a cold and wet spring, a normal summer followed. The weather became more erratic during the harvest. "It was hot for 10 days, then it rained for three weeks and then it started to freeze," explains the grower. He left between 8 and 9% of the production unharvested. In Idaho, the volume has reached a similar level to last year's; however, there have been some problems with the size sorting. For the Narkotahs, sizes are smaller, probably because of the heat. At the same time, there is a good demand for fresh potatoes. Besides the domestic market, there is also a higher demand from the international industry. The combination of all these factors has resulted in a market with slightly higher prices. Compared to last year, prices are 1 dollar higher. "The price is about 10 to 15% higher than last year, but it is expected to rise further." China is one of the world's largest potato producers and the total acreage devoted to potato production is very large. The crop is produced in many different places in China and therefore has different seasons, depending on the area. At the moment, the Chinese potatoes on the market come from refrigerated storage, because the new harvest won't start until April. Potato prices are also currently higher, as the refrigeration costs have to be taken into account. However, fresh potatoes do better on the market because the quality is just better than that of potatoes from cold storage. Therefore, potatoes are now being imported from South Asia to meet the demand for fresh potatoes. In addition to regular potatoes, Chinese sweet potatoes are also available until February. The sweet potato production is growing and the crop's popularity is on the rise in both the Chinese and the international markets. The price for sweet potatoes remains fairly stable. The product is mostly exported to Europe, Southeast Asia and the United States. According to the Potato Growers Association in Western Australia, the tight supply in the winter months gave way to smoother sales with the arrival of spring. This also yielded better results for the growers, who look back on two years with low prices. The warm spring was welcome after a winter with plenty of frosts in the state. Ease of access to the east coast market is quickly improving for the growers. The situation has also improved in Crookwell, New South Wales after an average spring. In December, there were some heavy hailstorms and thunderstorms. Some areas recorded up to 50 millimeters of rainfall. The planting season is in line with last year's. Growers start early to be ahead of the heat and dry weather of the summer. For the year ending in June 2017, a harvest of 1.3 million tons worth 717 million dollars is expected. Around 65% of the production is delivered to the processing industry. Out of the volume exported overseas, which amounts to just 35,000 tonnes, 59% is intended for South Korea.